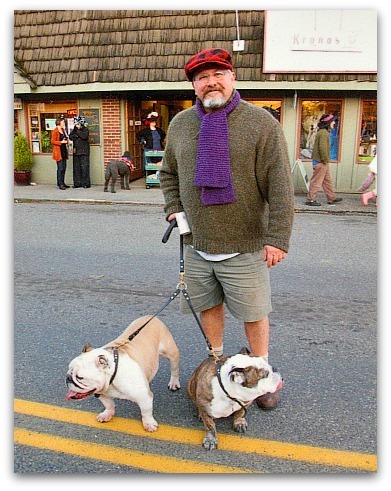 Vashon Islanders enjoy a style all their own. Most Fashion Police have been voted off the island and everyone tends to wear exactly what they want. 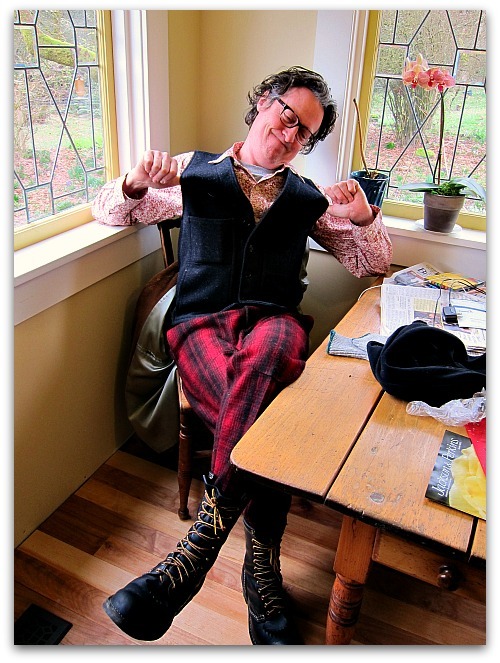 Vashon is a place where peasant skirts never die; tie-dye is a revered art form; the lumberjack look has remained a style staple since 1888; wool sweaters are second skins; and Gortex is considered waterproof silk. When my nephew from Miami first visited me here, he looked surprised when I got in the truck to go to town. He asked, “Don’t you want to change?” He had a point. I would have been escorted off South Beach for my look, but on Vashon, a paisley shirt, paint-stained overalls, plaid cap, and muck boots pass for acceptable shopping attire (or opera wear for that matter). I have been known to push the menswear envelope. One well-dressed friend and self-appointed Mr. Blackwell saw me in the grocery store and said, “Really Tom…really?” At first I thought he was scrutinizing my three quarts of Ben and Jerry’s and bag of Cascade chips, then I realized I was being taken to task not for what I was putting in my body, but rather what I was putting on my body, specifically a madras shirt, cargo shorts, panama hat and rubber boots. I smiled politely, and thought dare I take fashion advice from a man in a mock turtleneck and a pair of Dockers? 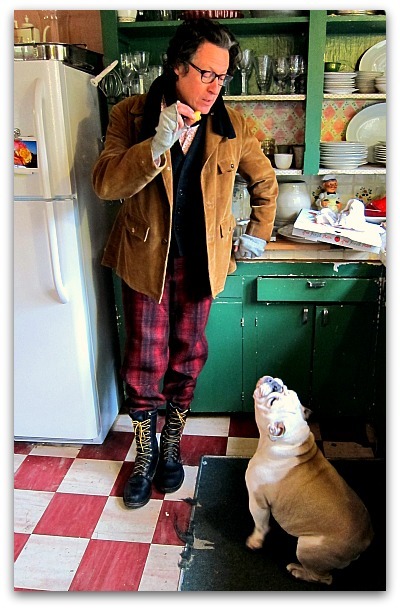 Just yesterday, my friend Greg dropped by for coffee, sporting a Northwest look that was worthy of a kitchen photo shoot. I do believe Eddie Bauer would have teared up over the look, I know I did. Bravo Greg, well done, and welcome back home to the Pacific Northwest! Don’t be fooled; Boz isn’t begging for that apple treat, but rather for a few fashion tips from Greg. OMG, tears! Not from the onions that I am sauteing either!! Massive hugs from Maury (hey, I’m only renting, OK??). And thanks to you Tom for making my landing so damned pleasant and easy. Oh my goodness! How decent of Greg to wear pants that match your kitchen floor. As for Boz, it looks like he’s howling his “dichromatic” approval. You have me thinking that my Carhartt loving Big Guy’d feel right at home on your island. Thanks for my chuckle of the day Tom. It’s always fun to see what you’re up to, Tom. Pam, thanks for visiting, and I visited your website and love your photography! Your posts always make me laugh! I think the funniest part was when I scrolled to the bottom, and there were “Ad Choice” ads for clothing described as “sophisticated”. Great post, just the chuckle I needed on this slightly snowy morning. What’s wrong with a madras shirt and cargo shorts? I never realized the sartorial standards on Vashon were so lax, makes it sound like Paradise to me. I love your purple scarf/muffler. Alison, thanks for the purple muffler love, now if I can just find where I left it. I don’t want my last comment to sound curt: Tom, only you can pull off a hand-knit (?) purple scarf, driving cap and bared-knees with panache. I love this look (his and yours)! Love the boots! I want a pair! Robin, I’ll pass that observation along to Greg, I could see him struttin’ the catwalk with a ghurka bag in one hand and double edged axe over the shoulder. Greg looks fabulous!!!! And so does your purple scarf! Here’s to looking how you want! Caleb — that’s for the vote of support! Haha! your photo and post made me chuckle. Hey you are a dandy (I hope it is the same meaning as in French) except Vashon-style. I have a pair of those boots courtesy local thrift store- where else?! One must really, really want to wear them and NOT be in a hurry to get out the door. Filson is the best, esp. for Vashon. My neighbor came over with a cool wool vest and I asked him where he got it: FILSON. Went by their store in Seattle and thought I could be costume designer for True Grit. Having to get used to the Vashon fashion of shorts in the winter. Nuns sent me home in third grade for where shorts in February, and we know how long it takes to get over reprimands from Catholic nuns. I love it! I try that around here to some degree but the locals are still pretty staid. I love that the inhabitats of this special Island wear apart clothes. I am also a bit like that. You guys could not be more stylish! Variety is the spice of life. Say hi to Gracie and Boz!